Here's an interesting indie movie that takes a valiant stab at something that's preoccupied many fine writers over the decades. Is it possible to take a scientific approach to life after death? The story begins in 2002, and an experiment in which two scientists hook up a hapless student volunteer to what looks like a very old fashioned stereo system combined with a brain scanner. It is in fact a machine built back between the wars by no less than Thomas Alva Edison. It is device designed to help contact the dead, via an old-style Bakelite telephone. And it works. Sort of. We move forward to the present day and find Brayden Taylor, a young anaesthetist, coming to terms with the death of his girlfriend, Abbey. A chance conversation with a colleague leads Brayden to look into the effects of ketamine on perception. The drug was used in unethical experiments a few years ago by a brilliant physicist who has since disappeared. It takes a while for the principal characters to be teamed up for the next bit attempt to cross the ultimate divide. The gang includes Craig, the original subject/victim, blinded by his first brush with the machine and now working as a medium on evangelical TV channels. There are some good performances, notably from Kenneth Hughes as Meistenbrock, the cold-fish boffin trying to improve on Edison's design. Hughes has a lot of tough sledding as he exposits like a boss, revealing what Einstein's God Model is, and how it fits with M-theory and superstrings. 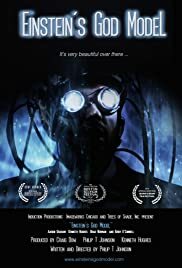 This is a sci-fi paranormal movie that does hang together and doesn't insult its audience. The climax is, of course, Brayden being strapped into the chair, wired up to Edison's dodgy machine, and having his bloodstream pumped full of crazy-juice. Cue some fairly impressive effects, given the limited budget, which attempt to demonstrate the soul's journey to another realm. And that ends one story, and begins another. This is not a glossy Hollywood production, but it's pretty stylish nonetheless. There are some shocking and moving moments, and a few neat twists. A strong supporting cast includes Brayden's dog, who almost steals the show a few times. And the opening credits are amusing, just tongue-in-cheek enough to lure in the nerds. Try and catch this one if you can.